There’s been another upgrade to Second Life, and I haven’t been online consistently in a couple of months. So I went online today to check in, pay rent, sort inventory; boring stuff to some, but for some reason the purposelessness is relaxing to me. While doing this I like to hang out somewhere with a good music stream. Which is kind of annoying, because David had upgraded this computer a few months ago with a better graphics card. Also, it’s abundantly clear even to me, a non-creative, non-builder, non-landowner, that something is terribly wrong in AV-ville. Sure, there was a wacky story this week about the couple that married in real life, married in Second Life, and then the wife found her husband in an online affair. No, this is about the little things; friends and groups of friends pulling back from the amount of virtual “land” they own, an increasing number of group messages offering land for rent, homes for rent, anything at all for sale. Sad announcements about open space being let go, because the price recently shot up. Notecards of online chats with the “Lindens” posted in public places with protest flags and “Save Open Sims” signs. And really small, little things, like the Gardens of Apollo. The sim owner may have changed the music stream from a rather expensive one run as a subscription by Artists4Mercy so something less expensive. It sounds totally different today, but I can’t confirm that it’s actually been changed. I’ll have to talk to some friends and see what’s been going on. Right, right, right…. some actual blogging, rather than mere links shared lazyblogged via Google Reader. It was a late start, but David had made some good, strong coffee (and didn’t have to be prompted via Twitter) and I got to church in time for most of choir practice. I’d gotten word that the father of a good friend had died over the weekend, so the first thing I had to do was give her a hug and a smooch. Was surprised to see her standing at the rehearsal piano with the others, but she looked fine, and not wrecked, so it was obvious she was there for a little “getting on with it” action. So we read through it, and although the notation was tricky and the harmony sketchy, we got through it. Our youngster, Holly, was not feeling good so she promised to go home early once we practiced. She works hard, that kid. School, and job, and yet more responsibilities, plus music. Anyway, while practicing we were happy to see [Pirate Pete] come in slowly, with his partner [Barry Tone]. Whew. Well, what to say? [Pirate Pete] was beaten up a few weeks ago and hospitalized with skull fractures, and he sustained some kind of neurological injury. He can’t remember the attack, walks very slowly and is very wobbly, and really shaky when standing unassisted. And a few weeks ago he was a very vigorous and able-bodied middle-aged man. There was time for a quick and very gentle pat on the shoulder (again, looked very rocky). [Barry Tone] stayed with him through the service rather than taking his usual place in the choir. So that’s another choir buddy hurting. I had a long talk with [Pirate Pete] afterwards, more on that later. A few unfamiliar faces. People trickled in. Fr. Ted dropped in (formerly vicar at Holy Innocents). A guest preacher came in, Randall Warren from the Diocese of Chicago, so we had a plethora of priests – a total of four either participating or partaking. Priests: we has them. That’s Randall on the right, talking to Mark, who still occasionally attends St Nicholas post-merger. Randall is Canon for Development and Pastoral Care, and he was on hand to preach both services and cheer us on as we mark another milestone in our growth toward full parish status. He’s both very excited about the coming building project (which seems to be nearly back on track again after a long “waitabit” ) and about what we’ve been doing. And, he has mad preachin’ skillz. His skillz, let me show you them: no notes! Empty hand! He certainly prepares carefully – he always starts with “a laugher,” and then an illustrative example, re-states the core text, and brings in some reading from other sources that he’s done in the preceding week. And he brings it home, tying up loose ends and weaving a fabric that you can read like a tapestry, all while standing “down front” and away from any lectern. He’s also the only preacher I’ve ever seen at St Nick’s who didn’t use the microphone, didn’t NEED the microphone, and was not ONCE interrupted by a jet on final approach to O’Hare. We’re on the flight path most Sundays, and that last point is near-miraculous. I suspect that even had there been an overflight, he would have been clearly audible over the roar; he knows how to project and get the most out of a room’s acoustics. The musical stuff all went along as it normally does, and we were pleased to hear that “the vicarage” has finally been vacated (long story: back rent, years of basically writing it off, need the space). So after the service, we were all invited to go over to the house (which is on a lot kitty-corner to the back of the church) to go through it and see what needed to be done. So the plan, since the housing market went bad, is to move programs into the house such as Sunday school, choir, and various AA/GA/support meetings. We’ll be able to use the church in the evenings again soon, as currently there’s only Wednesdays when we can schedule something and not turf one of the support meetings out. I chatted with Fr. Paul, our resident folk-musician/priest, about the possibilities and looked around as the Bishop’s Commitee did a “walk-through” meeting. The Sunday school kids are thrilled. Naturally, with so many little rooms and doors, we’re scheduling something like “Keeping God’s People Safe” training as soon as possible. The little boys were inclined to shut doors (to keep girls out) and such… so we’ll have to educate ourselves about the Proper Use of Rooms with Doors. After I wandered back in to the church, I chatted with [Pirate Pete], who leaned casually against the doorjamb at the back – but it was more for support rather than to look cool (which he just does naturally anyway). Heard more of the story, gave more support, offered whatever help I can give. What there is of it is not a pretty tale, and there seems to be little interest on the part of his local police to investigate or prosecute… and even less interest on the part of his neighbors to come forward on his behalf, because they seem to be afraid of the consequences. It’s someone local, he thinks. Maddening to be a victim, and not know if the person who just walked past your house is a neighbor, an assailant, or both. I was also surprised to find that he comes from way down beyond South Chicago, just over the line in Indiana. But was not too surprised to find that as far as welcoming and inclusivity (aside from some stalwart Chicago and west suburban parishes that are hard to reach for him), we’re it for him and for [Barry]. And that’s just sad. I think there might be other places, but they’re uncongenial musically or liturgically, or make them feel just a little uncomfortable. So they’re with us, and we’re glad of it. [Pirate Pete] is colorful (and has a great sense of style) and [Barry] literally anchors the choir, usually singing baritone. And it seems like it might be a good idea to use pseudonyms, since I didn’t mention the idea of including them in a blogpost to either of them. Which is also quite… maddening. And so after traipsing around in the wet grass looking in an empty house, and eating a lot of Oreos and drinking coffee with the forum, I headed for home, started some laundry, and logged in to Second Life. Blah, blah, blah Second Life! Is that all you ever do, Red? Well, but… it’s fun and relaxing, and also a great way to put off chores. So, WIN. Sundays are the day my home sim’s weekly newspaper comes out. It seems we had a panther attack, and a noble knight died well on the fields of battle and was buried in the graveyard (I’ll have to find out what the real story was, the editor may have embroidered JUST a stitch or two). The weekly Celtic music performance at the Green Dragon had been canceled on account of bleargh. I do enjoy reading the Sunday paper with my post-church coffee (that’s post RL church). The thing was, it was your basic Sunday not-much-going-on kind of day, but then I found several fun events to go to, and one very interesting solemn event to attend. By the end of the day, I’d kind of run the gamut of Life, the Universe, and Everything. About the first thing I did was check in at the Snail Races, which was just to look around, because they only schedule events on Saturdays. But I was surprised to find several people getting ready to run a practice race, so okay, I stayed to watch the time trials. No commentary, which made it kind of hard to follow, even with the bouncing benches that follow a designated snail. You can watch previous, full-on broadcasts (with wacky commentary and slick graphics and “camera” work) anytime online. The course is constantly changing: currently there’s a collapsing bridge over a tank full of kitty-eating sharks with frickin’ laser beams on their heads, among other things. After watching the previous broadcast just to get the gist of where things are (It’s a couple of months since I attended Race Day), I found a really interesting venue that looked promising, New Music Live at HD Artists Hall. Or was this Saturday? In any case, New Music is mostly electronica, with a strongly classical bent, but definitely of the 21st century (often with a good beat, and you can dance to it). I ended up joining the HD Artists group just to get on their announcements list. Great stuff, nicely hosted. It’s an Internet radio simulcast, apparently, I’ll have to find out more about their stream. If that WAS Saturday, oh well; things kind of smush togther in SL, which is why I really should keep a better journal of my doings there. Later on, I definitely did go to church for the noon SLT service at Epiphany, and chatted with people afterwards, including my friend Cady. Also, tried not to chat with a rather strange lady who seemed to be baiting us with dark hints about being possessed by a little devil attachment. I think people took long enough to ensure that there was not a real cry for help, and to verify that indeed someone was trying to pull a not-very-funny prank. Whatever. That’s Second Life church. After that, I was dinking around sorting crap and stuff and treasure, and got word that my neighbor Mistletoe was having an opening party to celebrate her fall fashion line, with a DJ. Well, that turned out to be an extremely fun time had by all. The music was dub, the elves be chillin, and there was even a large but shy dragon. Wow. Talk about cultures clash. My friend Cady (yes, the one from church) threw on some medieval glad rags adn came along – we danced, relaxed, and chatted for at least an hour or more. Then that started to break up, and I checked on the laundry and made the unfortunate discovery of a pen in the dryer – sound of anguish well up from the underbeneath! But only one top really showed signs of spots, so not so bad as it might have been. After some reading and catching up on news, back online to see what was going on. Dancing again? Okay, the DJ is a friend and always plays great stuff. Mostly, I was reading the news and thinking about the stupidity of the American political process. It was both heartwarming and mind-boggling; the person was a highly respected and accomplished person, in both his real life, and in his Second Life. I was able to get to an obit and was very moved by it. It was also moving to see what his online friends had pulled together – he was the creator of a very popular sim called “Diegoland” and many people kind of got their start there in music or spoken word performances – back in the days when all this was very new. I was surprised to recognize a couple of artists – visual and performance – plus there were a lot of musicians who chose to perform. Technologically, it was a major challenge to pull this off, with so many people broadcasting by “picking up” the stream from their locations scattered all over the country. Most people ‘there’ (virtually there, that is) had never met this guy in real life, but they cared very deeply for him because of who he was and how he chose to present himself in the online milieu. He was, by all accounts, a healer-knight in both worlds. And an accomplished musician, too. There were moments of inadvertent comic relief – it would not be Second Life without an SL moment or two… one woman started to type a command as she started to “speak” at the microphone, and inadvertently sent a pretty funny chat macro, complete with sound effects. And… there was a very earnest performance by a rather good Elvis impersonator. I… well, it was heartfelt. He loved the guy so much, he was willing to perform, you can’t fault him for the effort. Most of the other musical stuff was pretty good quality, good sound. The speakers were less successful, as maybe some hadn’t really been prepared with a good quality mike for voicechat. But they tried, and just like in real life, people strained to hear. Unlike in real life, though, they did that by “moving camera” (the viewpoint can be set to see and “hear” from whatever spot you wish within a fairly large area). It was the largest crowd I’d ever seen in one place in SL. I think the venue is on the edge of several adjoining sims, in order to spread the load. It was quite a testament to the memory of their dear friend. I contented myself with sittinq quietly, listening, watching people, and IMing with an acquaintance, who was also invited from the same dance party. In fact, it was the DJ, who apparently wrapped early so he could attend. A couple others I knew from my groups were there, too. In some ways, SL is like a medium-sized town – depending on the hour of the day, it’s likely to be the same few people logged in…you tend to run into them at art galleries, musical events, and dance events. So: even in Second Life, there’s death. Not just the fairy-tale fantasy of a noble knight sacrificing his life for a just cause or a lady’s honor, but the real-life tragedy of a good man gone before his time, missed by his friends. And that makes it.. yep, 3 services of one kind or another that I attended. Plus a lot of time spent “thinking good thoughts” for [Pirate Pete]. Its a lot to process, actually. So many issues, problems, challenges, triumphs, and sorrows. And laughs. Lots and lots of laughs, even with some tears mixed in. I recently took another look for a Second Life IM client. There’s supposed to be something called SLim that’s official, but I bypassed it for something called AjaxLife, which I’d previously tried back when it was a light Web interface that just barely ran on my iPhone.Â It runs well on a normal computer, though. 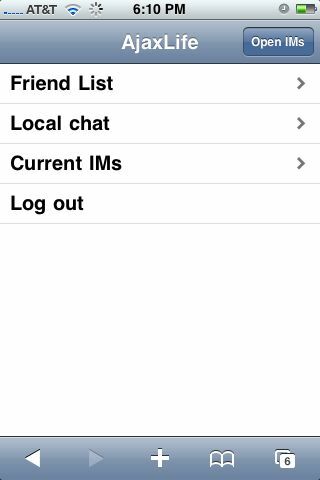 Now there’s a much better iPhone interface, which allows the user to log in, IM friends, and chat locally at whatever your default login location is. You can’t move your AV, so you should be sure you’re somewhere safe and not in the way. But you could theoretically attend a meeting if you planned ahead (and maybe added a courtesy title to explain your immobility). About the only thing you can’t do that would be useful is send or receive group IMs. Also, you can’t read IMs that were sent to you while you were logged out. They’re still waiting for you when you log in normally, though. It’s a curiousity; it might come in handy if you’re a landowner and need to contact someone to fix something. Also it’d be stellar for breaking up with a partner as long as they know you can’t be bothered to drop the bomb in (virtual) person. Could come in handy for establishing a cop-drama alibi, too. It works fine for what I might need – satisfying the occasional curiousity about which of my friends are logged in, or checking in with them when traveling without my laptop. I logged in while on break today, for example; surprising how many non-Europeans were logged in in the middle of a workday. Screenshots below. Because of course I had to post via iPhone, too. UPDATE: Added a few links, since the iPhone doesn’t do that well, and fixed the annoying WP missing-brackets bug before publication. So at least now I know Flickr isn’t the culprit. The new version of WP definitely strips brackets if another application is actually sending the post to the server. Anyway, the creator’s AjaxLife Blog: iPhones post explains that if you log in to http://blog.ajaxlife.net/ via iPhone you are automagically re-directed to a “secure login proxy.” It currently does not work with other cellphone Web browsers. It amused the hell out of my virtual landlord last night when I IMed him to ask if he could see my message and told him I was logged on via an iPhone. I noted that based on the attachment messages in my local chat screen, it was likely that my AV was physically present in my little priory cell. 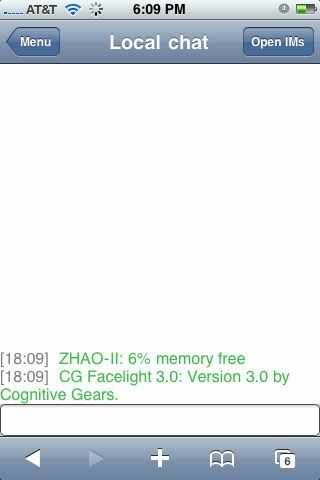 The local chat screenshot shows something called “ZHAO” and something called “CG Facelight” loaded, some attachments I was wearing at logout. UPDATE:AJAXLife was de-activated asas reported on Katherine Berry’s blog yesterday. It’s a sad thing, because it was a brilliant idea that was well executed. Frankly, I’ve been using the Metaverse app on the iPhone exclusively, but I’ll never forget the feeling of awe and wonder when I managed to log in to Second Life from my then-new first iPhone at a Panera. Reuters/Second Life Â» Second Life on the Xbox/PS3/iPhone? Now, weâ€™re not banking on a Linden Lab-supported rollout of Second Life to game consoles and cell phones just yet. Veteran Second Life watchers may recall numerous incidents in which junior executives at Linden implemented policies the company later backpedaled from. I’m pretty sure this would be bad for me, although I wouldn’t mind being able to IM friends or appear as a crappily-rendered ghost if logged in via cell phone. Heard on Second Life (I hang out at Dancing Virtually events): Condi, Condi. Gotta get it. It works as political commentary, but it’s a really great reggae dance song. Okay, this actually makes a certain amount of sense, except that I have multiple versions of the animation overrider, in folders with different outfits. If this makes no sense to you, relax, it’s a mini-post. If Second Life denizen General JC Christian, satirical blogger and All-American truthiness ninja saw this, he’d have an attack of piston envy. We’re in the family waiting room at the day surgery center, waiting for the surgery of our dear family member to finish so the surgeon can come in and give us an update. There will be at least a couple more hours waiting after that while the patient is in recovery, and we’re most of us pretty much here for the long haul today. Unlike last time, which was marred by the unseemly haste the patient was booted out after surgery, this time there’s more personal choice involved, and the option to stay for at least two or three days or until everyone is comfortable with the idea of convalescing at home. Thank goodness. David and I were greeted at the door by a very friendly volunteer, who recognized the surname and directed us upstairs to the family waiting room for the day surgery. From there, we were guided by another friendly volunteer to the pre-op room where our kin were stashed. There was a certain amount of medical skirmishing about with things on carts and rolling stands and putting on air-powered leg massage pants and starting IVs and things. And then there was a move to a second room, which had a locked-in laptop that had to be used for final checks. The anesthesiologist came in to talk – a very kind and very young man who was a dead ringer for the actor that plays the cute assistant pathologist on NCIS and then the surgeon came in – same one as last time, actually. She’s a very forceful looking tall blonde… has almost an ex-military air about her, very confidence-inspiring. She briefed us and apologized for the delay, as she’d been pulled in to do an emergency appendectomy. She’ll be here in the waiting room (they have private consultation rooms right here) as soon as the surgery is over… probably in no more than 15 or 20 minutes or so now. I tried to moblog the waiting area, but the picture never showed up at Flickr… probably just as well, as my tradition of taking moblog photos from hospitals hasn’t been all that lucky. It’s a clear, cold day and the sun is out, so the drive down wasn’t a problem, but physically getting here requires a GPS and a lot of zig-zagging around. In looking at the map, either there was a construction detour that forced us to take a meandering route – or the GPS in the car took us on a wild-goose chase, because it appears we could have gotten off the freeway and taken a straight shot right up to the doors of the hospital. Meanwhile, I’m multitasking; I started to restring some beads on the Anglican rosary I made myself last year, I’ve got Second Life up so I can listen to a particularly soothing music stream, do Tai Chi, and possibly chat with friends, and of course there’s all the bloggity blog stuff to catch up with, not to mention reading newspapers online. Plenty to do to keep my mind off of the current situation. The boys are all gabbing away talking about laptops and tech stuff… one of my brothers-in-law has the coolest little mini-computer that made David go “OOOOOooooooooh!! !” and we’ve been catching up on the doings of nieces and nephews with my other brother-in-law. The waiting room TV is set to “FULL BORE” in my opinion, as the soaps are about to start now that The View is over (I can’t stand women’s chat shows, that high-pitched cooing and cackling drives me crazy). Noise-canceling headphones are a Godsend. I think David is actually doing some work-related stuff, he has that ability on his laptop. Not me; hence the book to read, notebook to write in, beading project to tinker with, laptop with wireless to keep me occupied. More later when we find out what happens next. I do know that some results from pathology will be back as early as Monday, which will tell us more about what to expect in terms of how much chemo, how many treatments, how long, and also radiology. UPDATE:We headed to lunch after talking with the surgeon,who reports that there was one “aggressive but localized” site removed, so we know more about what to expect. The news is pretty good, so we went to lunch and are now waiting to see when a room in the main hospital will be available. The patient is mostly awake, talking, and resting in recovery for now. More waiting ensues, more phone calls to advise family and friends. It’s very nice to see some friends getting good publicity! [Diocese of Southern Ohio] Mary Wanamaker spends most of her time in real life. She works at Columbus State Community College in the mathematics department and is a member of Trinity Episcopal Church, a newly restored Gothic Revival building in Capitol Square in the heart of Columbus, Ohio’s capital and largest city.At Trinity, Wanamaker serves on the vestry, chairs the hospitality and newcomer committee, and manages the church’s website. But in her downtime, this 49-year-old engages in “Second Life” — an online, 3-D virtual world created by its residents. Here, she’s a member of the Anglicans in Second Life and participates in virtual worship services at the Anglican cathedral on Epiphany Island, a “virtual cathedral” where the first worship service was held July 2007. So far it has developed into a congregation of 271 people from across the world. It features traditional Anglican architecture, with vaulted gothic ceilings and beautiful stained glass windows. But its construction is revolutionary — it took only four months to build. I’ve been attending Compline services at the Cathedral in Second Life since my first week “inworld.” Mary Wanamaker is my inworld friend “Cady Enoch,” who also has done a lot of the work on the cathedral itself or adding attractive new features to Epiphany Island. Mark Brown is “Arkin Ariantho,” a very pleasant fellow who uses voice chat when he records his sermons. Due to the world-wide scheduling challenges, there are services at very odd hours – some to accomodate London time, some to accomodate New Zealand time, and so on. It’s a beautiful “build” and a very pretty island, with interesting places to explore. LOS ANGELES â€” Forget Second Life. The real virtual world gold rush centers on the grammar-school set. Trying to duplicate the success of blockbuster Web sites like Club Penguin and Webkinz, childrenâ€™s entertainment companies are greatly accelerating efforts to build virtual worlds for children. Media conglomerates in particular think these sites â€” part online role-playing game and part social scene â€” can deliver quick growth, help keep movie franchises alive and instill brand loyalty in a generation of new customers. One of my nieces is really into Webkinz. She breathlessly told me all about her pets, and I managed to avoid telling her in excruciating detail all about my many hairstyles and outfits and scripted swords (that I don’t know how to use) on Second Life. It was the longest conversation I’ve ever had with her, actually. I suppose she owns the little plush animals that come with a secret code that gains access to the site, or however it works. She told me all their names; the brown one is called Brownie, the black one is called Blackie, and so on and so on. When I was her age, my stuffed animals had names like Petunia the Skunk and Larry Lion.